Ornamental grasses are fairly new to the landscape scene—they've increased in popularity in the past couple decades. In regions experiencing drought, native and ornamental grasses are a smart and show-stopping part of the landscape. As more grasses are introduced from other parts of the world that share similar climates, landscape professionals aren't always in agreement on how to handle these exotic imports. Unlike rose bushes or boxwood hedges, there's not really a tried-and-true method for pruning or grooming ornamental grasses. Not every landscaping pro knows how to take care of everything in the garden, including grasses that can grow quite large—as in tall and wide. Follow these steps to groom your grasses and get them to looking great. Most ornamentals are easy to grow, requiring little water and fertilizer and no pesticides. They look equally beautiful planted poolside, blowing in the breeze, in containers on patios, and as accent plants in other areas of the landscape. Check out your neighborhood or cruise nearby areas where similar-looking ornamental grasses grow. Take pictures of specimens that are beautiful and thriving. Parks, botanical gardens, and public places like hotels or nice restaurants often use gardeners and landscapers who treat pruning as an art form, and really know how to cut and groom sedges and flaxes. Observe up close, if possible. Pennisetum setaceum 'Rubrum', commonly known as fountain grass or purple fountain grass, has been increasingly popular as both an accent plant and focal point in many landscape designs. Although Pennisetum setaceum's growing seasons are summer and fall, in some parts of the western United States where temperatures remain above 20 degrees, it can bloom and be a mainstay in the garden through the winter. Some care instructions advise to cut grasses down to a few inches above ground in fall or spring and to divide clumps when the grass's growth begins to weaken. In mild climates, moderate, frost-free temperatures allow fountain grass to grow throughout the year. Periodic grooming can turn your Pennisetum into a perennial. If you don't cut or groom ornamental grasses in the fall, they can become shaggy messes by spring. Rainy winters make everything in the garden grow, and ornamental grasses are no exception. Your work is cut out for you when the temperatures get warmer. Sturdy shoes—not sandals or flip flops. Start by gathering the grass together with your gloved hands and securing it with string, rope, or a bungee. This makes it much easier to cut it all at one time and get it more even. Adjust the rope or cord higher or lower, depending on where you want to cut the grass. Some gardeners prefer to cut the grass below the rope, because the cuttings are easier to dispose of or put in the compost bin. You can also grab a bunch of grass in your hand and cut above or below. You'll have to repeat this maneuver several times, but it works and may be easier for quick touch-ups. Cutting and grooming ornamental grass makes it healthier. By removing all that dry, old growth that is basically a big mess of dead grass, new growth will actually be exposed to sunlight and fresh air. While it might be tempting to mow-down a mess like this, removal of the dry stuff and a good shaping is all that will be needed. If you are compelled to cut ornamental grass very short, do not trim it any lower than 4 inches from the ground. Tap into your inner hairstylist as you lean over the fountain grass and comb or rake your gloved fingers through the middle of the clump, grabbing all loose and dead or dried-up hairs (blades/branches). Comb through the entire grass, and shake it occasionally to get out more dried plant material. You may end up with a good-sized pile of the dead stuff, which you should pitch into a portable container as you go along. Otherwise, it's a real chore to clean up all of those blades and clumps of grass after you've done the pruning and grooming. For impromptu touch-ups, grab a bunch of grass blades in one hand, pull them out to the side, and cut with a pair of hand pruners. Repeat throughout. Gather dead or dry-looking canes in your hand and cut down toward the base. To thin-out the grass, grab small sections in the middle and cut toward the base, at different heights. Try to leave some height in the middle, then gradually shape a bit lower on the sides. Once it starts blooming (which will be in the coming weeks, depending on where you live), the grass will have a more natural, rounded shape with arching, fountain-like "blades". 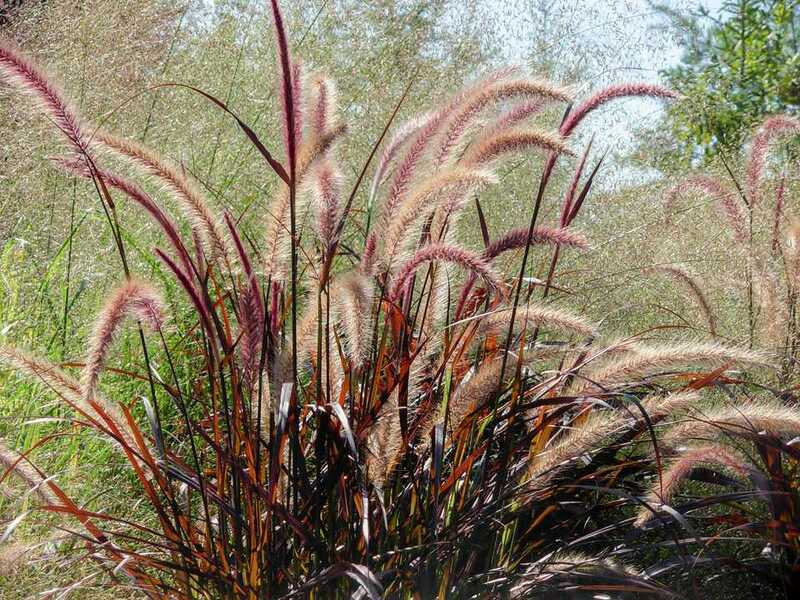 Hence, the name, fountain grass. After a few years, ornamental grasses will need to be divided at their base. How can you tell? The grass clump will be overgrown, possibly encroaching on neighboring plants or creeping out beyond the border or edge. In some cases, the centers of the grass clumps will have died out and need to be removed. Some, like this Mexican feather grass (Nassella tenuissima), are simple—just use a trowel to dig up a portion of the grass, roots and all. You can then divide the clump again, and replant them, although Mexican feather grass can be an aggressive re-seeder. In some regions, Nassella tenuissima is considered invasive and is classified as a weed. Under control in a contained, fenced yard, it is less likely to be a threat to the local landscape. Putting feather grass in pots allows you to keep in eye on them and give regular trims. For larger clumps that might have deeper roots, use a spade and some muscle to divide. Depending on the type of grass, you can either replant (and trim to about 4 inches above where it will be placed in the ground), or put it in your composting bin. What? You don't have a composting bin? Start one today. Many gardeners hack ornamental grasses like Pennisetum setaceum into all sorts of curious configurations so that they resemble tumbleweeds. The Facebook group Crimes Against Horticulture offers eyewitness reports of bad plant-haircuts, including the one in this photo that members thought looked like haystacks, While a hard, ground-level cut works well with some species, others just need regular light pruning and shaping. Fortunately, ornamental grasses are pretty forgiving. Groomed and pruned carefully and not chopped down to obscurity, these ornamental grasses are beautifully formed. Nice, healthy and how it's supposed to look— ornamental.